The photo shows the first Watford firefighters of 1868. 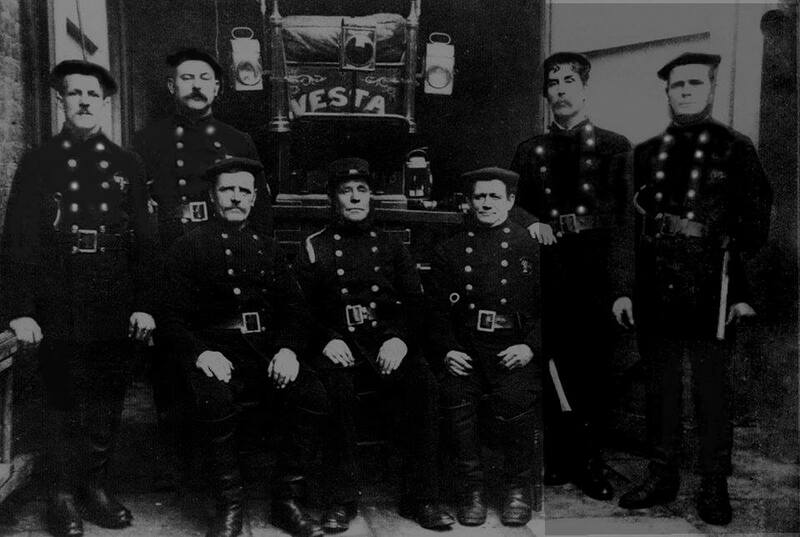 The horse-drawn hand manual fire engine was named ‘Vesta’ after the Roman goddess of the hearth-fire and household. It arrived at Watford Railway Station at 4.30pm on Thursday 12 March 1868 and was driven to Cassiobury Park and put to the test, with everything passing off very satisfactorily. It was specially adapted for the district – lightness and high wheels for rapid travelling, and had “Watford and Bushey Volunteers” in gold letters on each side. It was initially kept behind the ‘Rose and Crown’ (corner of High Street and Market Street), and the landlord (Mr J Read), was one of two people who supplied the horses. According to reports in the Watford Observer (March 1868), it cost £191 2s. 4d.